Now that you have seen my twist on Green Bean Casserole, I would love to share with you how I serve my casserole, #ThisIsMyTwist. I serve my casserole in bacon cups. I find this a great way to get kids to eat the veggies plus who doesn’t love bacon? Bacon gives the casserole that little extra taste that takes my recipe from good to amazing. I was surprised how easy it was to make bacon bowls. You will need a muffin tin or 4 (4oz)mason jars, and 1 pound of thick cut bacon. I used the mason jars. 4 full slices makes one bowl. Preheat oven to 400. On a flat surface layout your 4 slices and cut them in half so you will have 8 long pieces. Lay 4 slices on a flat surface next to each other. Take one slice and weave it between the 4 slices. Repeat that with the other three slices. Making sure it is going over and under. Place your weaved slices on top of the mason jar. Repeat this process for how many bowls you would like. Bake for 45 minutes or until bacon is golden brown. Remove from the oven and let cool. Fill each bowl with green bean casserole. Enjoy! This looks very delicious. Thanks for sharing. We will try this out. Bacon bowls would be fun twist this Thanksgiving. This looks really good. Anything is better with bacon. This Bacon Green Bean Casserole looks so delicious. I am going to try it out. This looks so good! I love green bean casserole and you’ve made it even better! That seriously looks delicious. Such a neat idea. Oh my gosh these look so yummy!! I can’t believe I have never thought of this before! This looks as delicious as it sounds! I’m so happy you shared this! Perhaps I’ll give it a try on Thanksgiving! This is a brilliant idea. I always sneak a few slices of bacon into my green bean casserole. These look so good. Maybe I can sneak a green bean into my daughter’s mouth this way. I LOVE your twist! My husband would love to try this, so i will be making on thanksgiving, I am sure it will be a winner. I will keep an eye out at Walmart for your recipe. 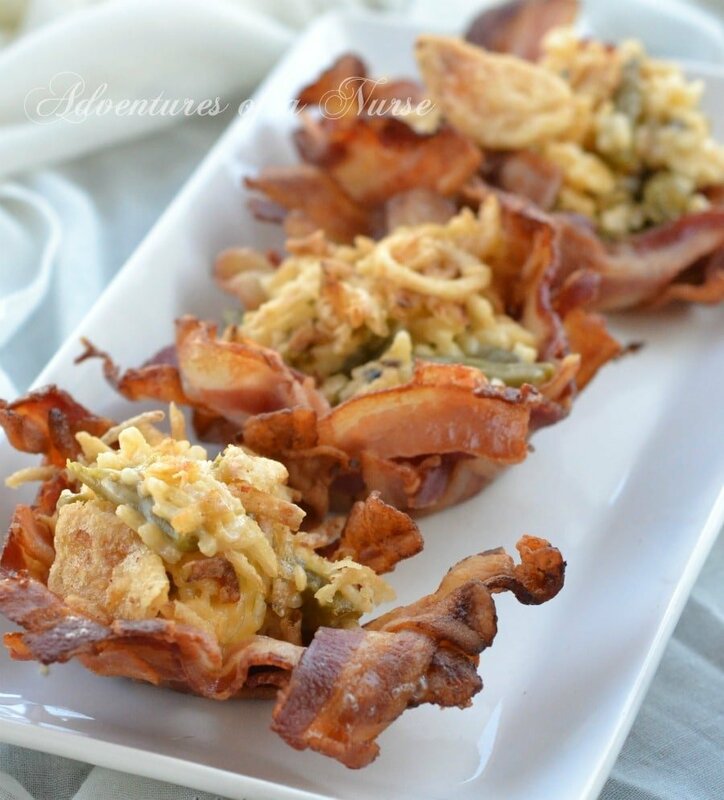 I’m not very fond of bacon but the green bean casserole sounds pretty good. I’ve never tried it. I say anything with bacon taste better. Totally tried this tonight, it was amazing! This looks amazing! I will have try this. These look so amazing. 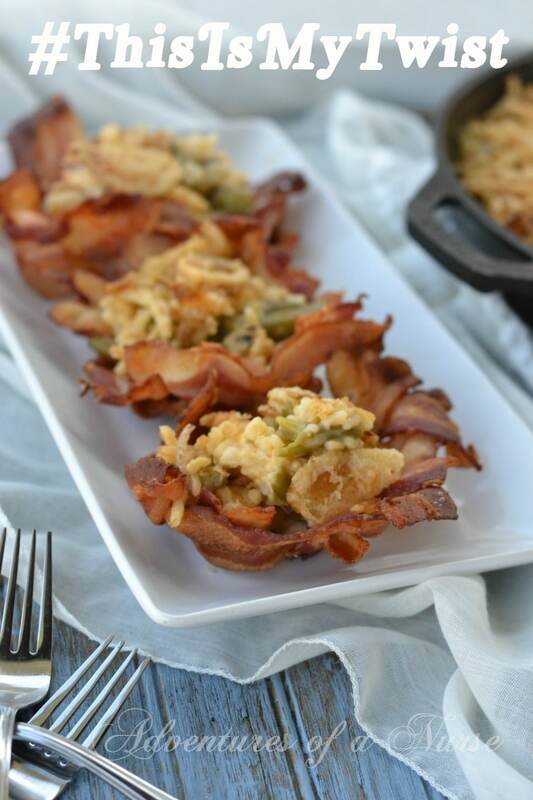 Green Bean Casserole is a huge hit in my house anyways but with all the bacon lovers this would be the ultimate twist. This is awesome! I LOVE Green bean casserole and I bet this makes it even more tasty. This looks awesome! I will definitely try it! Happy Thanksgiving! Love this “twist” of yours, seems easy and delicious! I would love to serve macaroni and cheese in these. This looks so good. Who doesn’t love bacon? I recently attended a wedding, and they had a “Bacon Bar.” You could get it in different flavors. 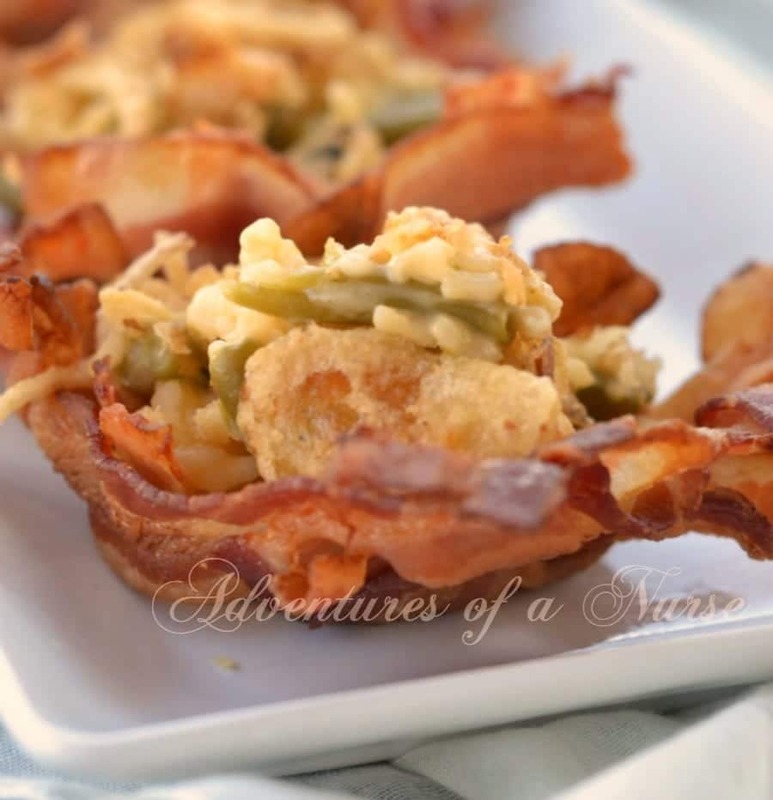 My husband would sure like this recipe, he really likes bacon a lot. I am going to give this a try for him. The bacon alone looks delicious. Together it is quite a combo!